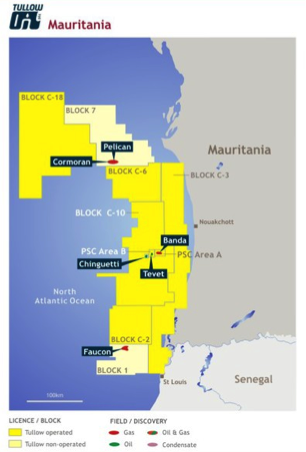 Additional information on Mauritania on energypedia. Mauritania was originally a nomad country, which for the last 50 years has evolved into a settled one. 65% of the population was nomad in 1965 compared to the 95% that has been settled in 2001. An urbanization process has been in place since the 70’s and the urbanization rate doubled between 1970 (22,7%) and 2000 (50%). Currently, the population growth is around 2,6% per year. All these transformations in Mauritania are affecting the energy consumption necessitating an evolution in the energy supply. Mauritania is mostly dependent on non-renewable resources (fossil fuels) and the access rate to the grid is pretty low. Some projects are emerging to benefit from solar, wind and biomass resources and to increase the access rate to the grid. According to RPTES/World Bank study, consumption of Energy Mauritania stands to 481.000 tonnes of oil equivalent (toe). Sectors that constitute the most important consumers are households (198.400 toe), mines and industries (147.000 toe), transport (118.300 toe), services (11.700 toe) and agriculture (5.700 toe). In 2003, a study concerning household energy consumption in Mauritania estimated that household energy relies mostly on biomass since it accounts for 87% (59% charcoal and 27,7%) of their overall energy supply. In rural areas, this figure is inverted such as in Guidimakha where 90% of households use wood for domestic cooking. In terms of volume, a PREDAS study has evaluated total wood energy consumption in Mauritania to 1,8 million m3. According to state of resources, Mauritania could supply only 5% of this demand. Production of electricity principally comes from thermo power plants (76%). The last 24% is insured by the electricity importation coming from Manantaly hydro power plant based in Mali. In 2011, electricity production stood at 136 megawatts (MW) in Mauritania and was 100% from thermo power. Mauritania aims to increase and diversify its energy sources. For example, it has developed an electricity plant that will be alimented by Banda gas. This facility should produce 350 MW in 2015 and will be connected to Nouakchott and Nouadhibou. Furthermore, the plant should produce 700 MW and could export electricity to Senegal and Mali. The Oriented Results Country Strategy Document for 2011-2015 indicates that the electrification rate stands at 50% in urban areas, 5% in semi urban areas and at 3% in rural areas. There isn’t much of a hydropower potential in Mauritania. Nevertheless, the country imports hydropower electricity from Manantali hydropower plant. This source can provide 30 MW to Mauritania, mostly for the cities of Boghé and Kaédi. Mauritania aims to increase the share of hydropower electricity to 30% by 2015. To do that, it will add to Manantali, the imported electricity from Felou (20 MW) and Gouina (40 MW) hydropower plants. Since 2013, OFID, IBD, ISFD and the Government of Mauritania funds have co-financed a project of rural electrification by solar energy. This project is delegated to Agency for the Promotion of Universal Access to Basic Services (APAUS) and will allow building a solar power plant in Aftout El Chargui area (Gorgol Wilaya). Reduce annual CO2 emissions by around 15,000 tons. In Nouakchott, a solar plant developed by Masdar adds 15 MW more to the supply of electricity. It is expected to deliver 10% of capital supply. A project co-financed by Agence Française de Développement and the European Union in Kiffa started in 2013. It aims to build a hybrid central that should provide 2 MW of solar energy coupled with 5,6 MW of fuel energy. It should also connect the grid from Kiffa to Guérou. The Société Nationale Industrielle et Minière (SNIM) has also developed its own project of a solar power plant with the development of a 3 MW solar plant in Zouérat. Biomass potential is mostly found in the south of Mauritania, next to the Senegal River in Assaba, Brakna, Gorgol, Guidimaka, Hodh El Charghi, Hodh El Gharbi, Trarza and Tagant. These regions can supply 100 000 m3 per year. Supporting professional training and capacity development centers to add cleaner cooking stove production to their training programs. Recently, the National Assembly adopted a law that allows the acceptance of a FADES loan to construct a 30MW wind power plant. SNIM has also developed a 4 MW wind power plant in Nouadhibou that has been paid for with their own resources. In November 2015, the first commercial wind power plant in Mauritania started providing service to the residents of Nouakchott, the capital of Mauritania. The plant has an installed capacity of 30 Megawatts and would meet approximately 14% of energy demands in Nouakchott. The plant includes 15 wind turbines of 2 MW each and is divided into three lines. Around €43 million was provided by the Mauritanian government and the Arab Fund for Economic and Social Development for the construction of the wind power plant. Fuel potential is divided in two basins, Costal basin and Taoudeni basin. 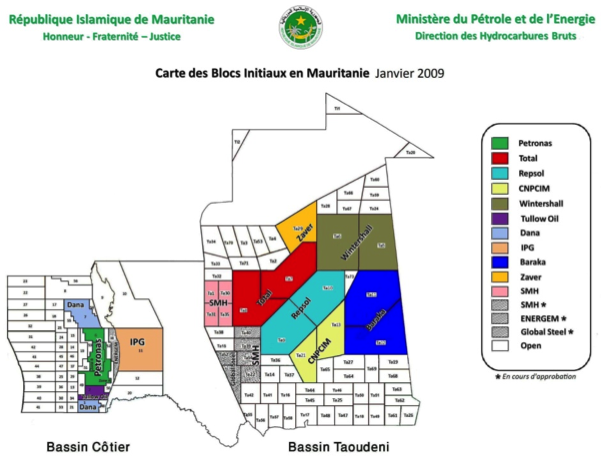 Fuel production is quite new in Mauritania. While exploration begun in 1960, exploitation is confined to two offshore fuel fields, Chinguiti (oil) and Banda (gas). Chinguiti field , which was originally exploited by Woodside has been sold to Petronas. Initially, it was expected to provide 76 000 barrels per day (bpd), but at the beginning of the exploitation it only produced 35 000 bpd and in 2013 this figure dropped to 4 000 bpd. Fuel has also been found in Cormoran, Pelican, Faucon and Tevet fields but it is not already exploited. Taoudeni basin is still to be explored. Several companies are implicated in this exploration including Total, Repsol, CNPCIM, and Wintershal. In 2012, Mauritania’s Prime Minister adopted an environmental national action plan (PANE 2) for 2012-2016. This action plan was developed by Ministère délégué auprès du Premier Ministre en charge de l’Environnement et du Développement Durable to especially include a wood energy strategy. This strategy covers the wood energy value chain (production, exploitation, distribution, and consumption). The Electricity sector is under the care of Ministère des Affaires économiques et du Développement, Ministère du Pétrole de l'Energie et des Mines, Ministère des Finances, and is regulated by Autorité de Régulation. Due to the failure of the privatization process, there is a unique operator, the government-owned electricity utility in Mauritania, la Société Mauritaneinne d'Electricité. Implementation of rural electrification government policies is led by l'Agence de Développement et d'Electrification Rurale et l’Agencede Promotion de l’Accès Universel aux Services.